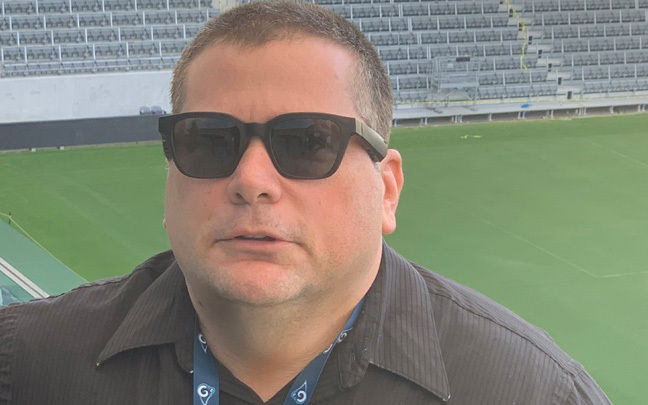 Last month, I attended a Bose event in Los Angeles and was able to try out the Bose Frames sunglasses. I was impressed, for the most part. I have been able to spend the last day testing the Frames, so here is my full review. The Frames, which have a metal hinge, fit very comfortably and can’t be mistaken for anything other than sunglasses. Each arm of Bose’s sunglasses contain a Bose speaker, and near the temple on the right arm is a microphone and multi-function button. The speakers are pointed backwards — this allows them to fire audio into your ears without the need for earbuds. In my tests, people can barely hear your frames play music, unless it’s completely silent and the volume is turned all the way up. So, in many ways, the Frames feel like headphones that don’t have to be centered on top of your eardrums. And they can also be used to make phone calls, which they are pretty good at. Unlike my experience with these last month, the Frames weren’t easy to pair with my iPhone. I downloaded the Bose Connect app, tried to pair the glasses, and wasn’t lucky. After restarting my iPhone XS Max and restarting the Frames, things worked. Other people have claimed to have an easier time. Bose Frames are stylish and fit comfortably. Once things were connected, I was mostly satisfied. I walked with the Frames throughout Irvine Town Center in Irvine, CA. For most situations, the volume was loud enough. However, once I was next to a waterfall fountain or the highway, I did wish the Frames could get slightly louder. The sound seems tinny at first. 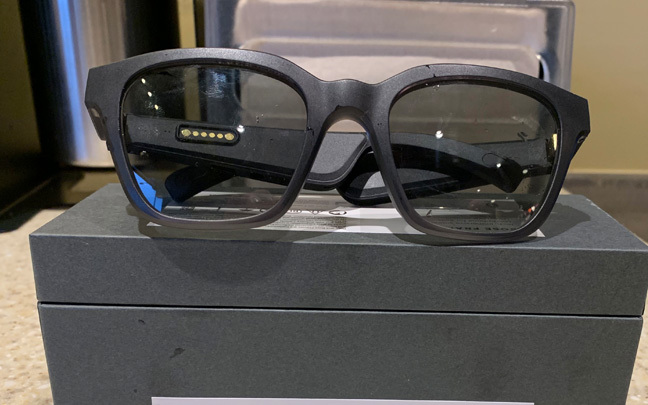 But once you break the glasses in and your ears adjust to the sound, the Frames produce audio that is better than the AirPods — the product I most compare them to, even if they seem worlds apart. The bass is decent considering the speakers are on a pair of sunglasses, but don’t expect to feel the “thump” you do with Bose’s headphones. The high ranges are prominent, and the mid ranges are somewhat recessed. In other words, it’s typical Bose sound, which — in my opinion — is a good thing. Bose Frames are well-priced at $199. The Bose Frames offer 12 hours of standby battery life, but only 3.5 hours of streaming playback. This wouldn’t be much of a big deal if it didn’t take the Frames two hours for a full charge. Still, I found myself being able to use these for most of the day (streaming and standby) without having to do any recharging. The battery life may be a disability, but it’s definitely not a deal killer. I expect that like the Bose Sleepbuds, the Frames will do well for a niche audience. The new sunglasses won’t be for everybody, but they may lay the ground for similar future devices. 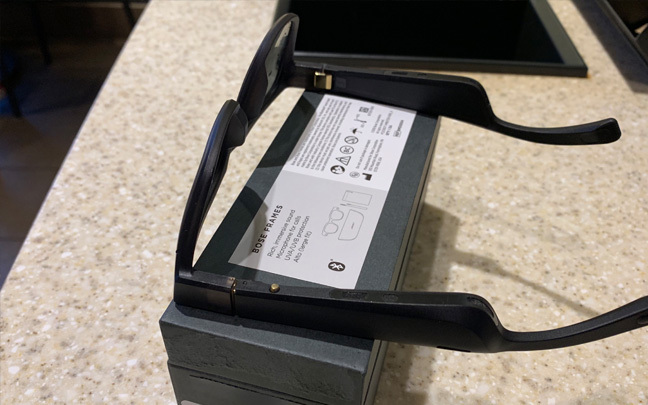 This entry was posted in Review and tagged Bose Frames, Bose Sleepbuds, Wearable Audio. Bookmark the permalink. Are Wired Headphones Becoming Extinct Despite Better Sound? Samsung Galaxy Buds: Stay Far Away! iReTron is rapidly becoming the world's leading source for the most reliable information about wireless technology, and for the hassle free trade-in of used cell phones and mobile devices. Contact Us today for more information about any of your trade-in or recycle needs.